We will update news on the Seahawks' practice squad in this space throughout the day. The Seattle Seahawks on Sunday officially signed seven players to their practice squad. The seven are: WR Kasen Williams, WR Kevin Smith, TE RaShaun Allen, OL Will Pericak, OL Terry Poole, RB Rod Smith and LB Eric Pinkins. Each of the seven spent the preseason in camp with the Seahawks before being released in the cutdown from 75 players to 53 on Saturday. For Williams and Smith, it is a big step in forging an NFL for two former University of Washington standout receivers. 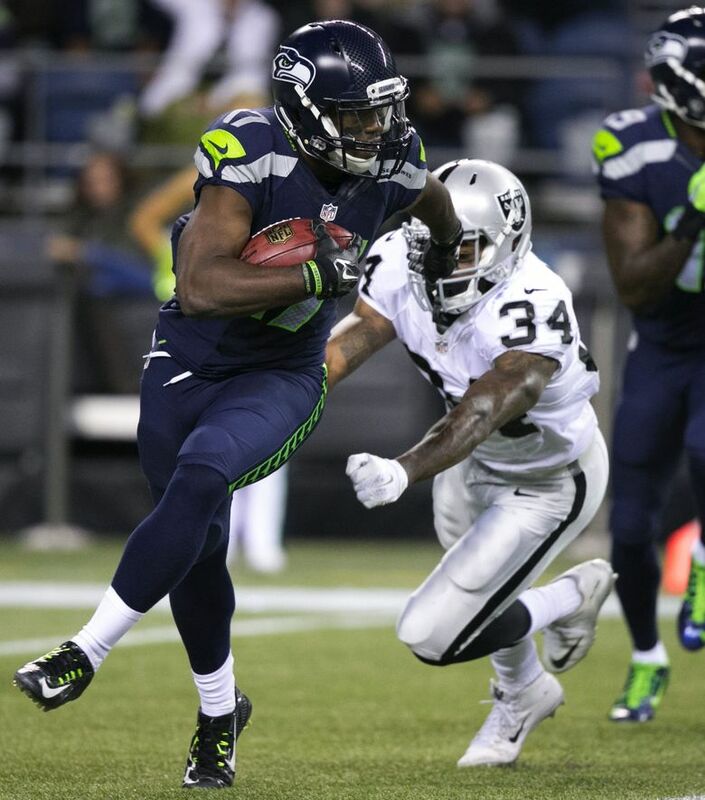 Williams, also of Skyline High in Sammamish, had a 15-yard touchdown reception in the preseason finale against the Raiders that surely helped him land a spot on the practice squad. Poole was a fourth-round pick in 2015 that the team will hope can develop off the practice squad. Pinkins was a sixth-round pick in 2014 who was moved to linebacker this spring. Smith is a rookie undrafted free agent from Ohio State who had 70 yards on 10 carries in the preseason and also six catches for 27 yards. Allen was on Seattle’s practice squad most of last season and also on the 53-man active roster for the loss at St.Louis. Pericak, from Colorado, has been with Baltimore, Denver and Jacksonville before signing with Seattle in February. He played all over the line for the Seahawks during the presason including at center. There was also a report that former Kansas City cornerback Kevin Short would join the practice squad, as well. The 6-2, 190-pound Short was signed by the Chiefs in June and recently release. However, Short was not on the list released by the team. There was also a report that former Tennessee defensive back Justin Coleman had signed but that also was not announced by the team. However, the Seahawks have three spots remaining on the 10-man team so Short and Coleman could be officially announced later. The signing of Poole to the practice squad means that every 2015 Seattle draft pick is accounted for other than safety Ryan Murphy, a seventh-round pick out of Oregon State. Murphy had yet to sign with a practice squad as of Sunday afternoon. KEVIN SMITH AMONG FIRST ADDED: The Seahawks began filling out their 10-man practice squad Sunday morning after players had cleared waivers. As of 11 a.m., three players were known signed by Seattle: WR Kevin Smith, who also played at UW; cornerback Justin Coleman, who played at Tennessee and was in camp with the Vikings and Patriots before being released by each; and LB Eric Pinkins, a sixth-round pick of the Seahawks in 2014. Smith and Pinkins were each put on waivers by Seattle on Saturday in the roster cutdown from 75 to 53 and cleared waivers. As for Coleman, here is his NFL.com draft profile and the story here from 247sports.com reporting his signing with the Seahawks. What happens next: Players who are released get placed on waivers and are eligible to be claimed by another team for the next 24 hours (The order of the teams getting first dibs is the inverse order of the standings). If a player clears waivers, meaning he doesn’t get signed to a 53-man roster, he can then sign with a team’s practice squad. So if no one signs Williams and Smith, and if the Seahawks want them back, both could join Seattle’s practice squad on Sunday. The basics: There are 10 players on a practice squad, and they, of course, only practice with a team but can’t play in games. A player on the practice squad can be signed by another team at any time, but only if that other team places the player on the active 53-man roster. Players can’t go from practice squad to practice squad unless they are released. Congrats @UWHuskyFootball alum @TeaMSmith8 Kevin Smith for signing with @Seahawks practice squad…had great camp – excited for his future.